Without a doubt, the BEST barbecue in Twain Harte. Take a look at the pictures. Great level parking for 4 cars on the property and level entry into house. Two entrances bring you in to the main level of this great home. 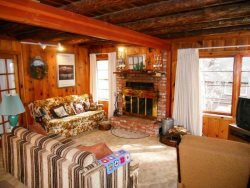 On the main level you will enter into the living room and immediately get the feel of the traditional Twain Harte tongue and groove knotty pine that we know and love. The living room also has a bumper pool/poker table/dining table, the kitchen with a dining area for 6, dishwasher and microwave. There is also a game room with a pool table. The laundry seconds as a full bathroom, shower only. There is also a half bath on this level. Upstairs there are 3 bedrooms and a den with a fainting couch, one full and one half bath, the full is a tub only. The master has a king size bed. From the master you take two steps up and across the den you take two steps down into the large sleeping room which has two Queen size beds and three single beds, up two steps into the 3rd bedroom with a queen bed. The deck is fantastic, it has a huge outdoor kitchen gas barbecue grill, sink, 2 refrigerators with side burner and griddle. The deck also has table and chairs to enjoy the fruits of your cooking labor. Time to put your culinary skills to work. There is also a covered porch in the front of the house with a table and chairs to enjoy your morning coffee. This home does NOT have TH Lake privileges. We must have 24 hour notice prior to your arrival. After hours number is 209-770-1624. 3 TV’s – one in the Master with cable and one in the Living room with cable and the smaller master suite TV with DVD player only. The care taker for this property lives on the property in a separate dwelling. Linen service is not included in this rental.